Total Solution: Chin Teik believes that coaching is a process to achieve specific business results within a specific timeframe. Chin Teik’s preferred service is to provide end to end coaching and consulting to an organization. Chin Teik works with organizations starting with the top management (Chairman, CEO, Executive Directors & General Managers) and begins with the measurable end-in-mind (core purpose & values, culture, vision & priorities/strategies) to execution (clarity in outcomes, lead & lag indicators & rhythm of accountability). he is able to coach senior executives in any industry. 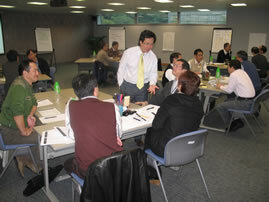 Approach: Chin Teik’s senior executive coaching adopts a transparent & close loop process designed in phases. ‘Transparency’ allows for clarity in expectations and support process for change between the coachee, the coachee’s direct manager and the coach. ‘Close loop process’ allows for timely feedback to reinforce desired behavior changes as well as re-direction if change is not progressing as planned. ‘Phase approach’ allows for results to be achieved as well as exit strategy for both parties.